Last Sunday was the ceremony in Want Manik, when seven of our boys along with over a hundred other boys went into the temple as novice monks. It was a very interesting, very dignified, very long and very warm ceremony and day. The boys had went to the temple already Thursday to prepare so they were already in place when the rest of us left the orphanage at 06.30 in the morning. The day began with speeches from various public figures, after that it was time for lunch and after lunch it was time for the boys to be shaved. Before the boys got shaved everyone who wanted could help cut their hair as it gives luck to have cut a the hair of a person who will be monk. Then it was time for the temple's monks to take over and shave off all the hair including eyebrows - it's amazing what a change in appearance when you remove hair and eyebrows. When all the boys were shaved they gotnew white clothes, and then the next ceremony began during which the boys will honor their mothers and say goodbye to their families - public crying is not very common in Thailand but at these times almost everyone cries, moms, boys and other relatives. Then it was time to go three laps around the temple. It's very hot in Thailand right now and even though they had prepared by spraying water on the ground it was almost to hot for the boys to go barefoot - the rest of us even got to keep the shoes on. 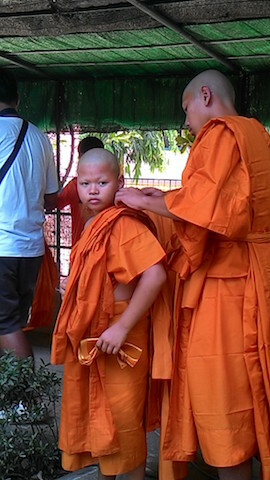 After the walk around the temple the boys took off again - now they would switch from the white clothes to real monk robes. The day ended with a final ceremony inside the temple and then it was time for taking photos before it was time to say goodbye - then it was 4 pm already. The boys will be in the temple for over a month so it felt a bit tough to leave them, but they have chosen to spend their holidays in the temple by themselves and we know that it is good for them to be there - they will learn to live ascetic, learn more about their religion and learn to meditate. Moreover, it is always fascinating to experience the serenity around all these boys although they will leave their families for over a month to live as monks.